Though recent models have improved, the Ford Explorer rollover rating for millions of older models still on our roadways is alarmingly low. According to the Insurance Institute for Highway Safety (IIHS), two-door, two-wheel drive Ford Explorers from model years 1999 to 2002 had the fourth highest rate of driver deaths among 47 SUVs in the study. 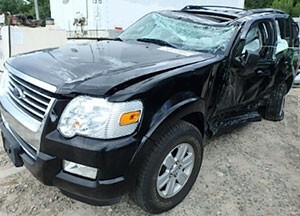 In fact, the Ford Explorer SportTrac had the worst rollover rate of any SUV tested. Ford Explorer rollover dangers will become worse as these and other such vehicles age. With shocks, springs, suspension, tires and linkages wearing out and becoming looser, the Explorer’s stability and handling will become even more difficult during emergency evasive maneuvers -- and even during normal, everyday driving. Also, when a Ford Explorer does roll over and land on its roof, occupants are in extreme danger of severe injuries if not death due to a weak roof design. A “roof crush” following an Explorer rollover can cause head injuries, brain damage, neck fractures, severe spinal cord injuries and death. Yet despite well documented stability problems and roof-crush defects, millions of Ford Explorers with low rollover ratings remain on our roads, endangering many Americans. That’s why Ford Explorer lawsuits must be pressed to spur Ford Explorer recalls, to hold Ford accountable for its mistakes and to get fair and proper payments for innocent victims. The Ford Explorer has had rollover problems since it was launched as the Ford Bronco II in March of 1983. For decades after that, Ford has continue to wrestle unsuccessfully with stability problems on the vehicles, especially when they have defective tires. The Ford Explorer evolved directly from the Bronco II as a family vehicle which retained the rugged nature of the Bronco II, which was rated the deadliest SUV on our roads by the IIHS. Even Ford itself, in an internal memo in 1987, acknowledged that the UN46 (an Explorer prototype) had worse stability than the Bronco II, while noting that this defect could be reduced by lowering and widening the vehicle. Nonetheless, by 2004 the Ford Explorer Sport Trac received the worst rollover rating of 14 vehicles in a government safety test geared to assess the chance of a rollover during sharp turns. The Ford Explorer rollover rating for the rear-wheel drive Sport Trac 4x2 SUV indicated it had a 30-40 per cent risk of a rollover in a single-vehicle accident. Its low two-star rollover rating was derived via a formula based on the SUV’s height and width between its rear tires, as well as a driving test involving sharp right and left turns. This low 2004 Ford Explorer rating for rollovers came despite the fact that, in 2002, Ford finally saw fit to widen the Explorer -- which it claims it did independently of any stability issues. What took so long? Even Ford executives acknowledged that Ford would lose money if it halted Explorer production until a fix could be made, so it kept selling the defective vehicles anyway. Prior to widening the Explorer’s wheelbase, Ford had made some small changes, including improving the suspension and tire pressure. But that didn’t fix rollover defects of the Explorer, which still required two more inches of width to gain more stability. Ford’s recklessness in waiting so long to improve on its Ford Explorer rollover rating has placed millions of Americans in danger. Fortunately, Explorer rollover lawsuits have prevailed for innocent victims. To what extent? In one year alone, Ford lost at least four Ford Explorer lawsuits with verdicts in each of $10 million or more. If someone in your family was a victim of a Ford Explorer rollover, notify the Willis Law Firm at once. Firm founder Attorney David Willis has been in the forefront of Explorer rollover lawsuits, having been involved in one of America’s initial Ford Explorer rollover and Firestone tread separation cases in Texas in 1997. Mr. Willis then received the Steven J. Sharp Public Service Award for his contributions in gathering evidence and investigating Firestone tire belt separation and Ford Explorer rollovers, an investigation which helped bring about America’s largest tire recall in history. Give the Willis Law Firm a chance to steer your case to a successful resolution. Contact us today about your Ford Explorer rollover injury, and we’ll quickly provide you with a free legal consultation. Then you can decide how you want to proceed with your Explorer rollover case.